Remember when I said I could have this chocolate cake every birthday for the rest of my life and be happy, nay ecstatic? It happens if one is too busy slobbering over pictures of chocolate sour cream icing to remember that one traditionally makes this cake every year for one's birthday. 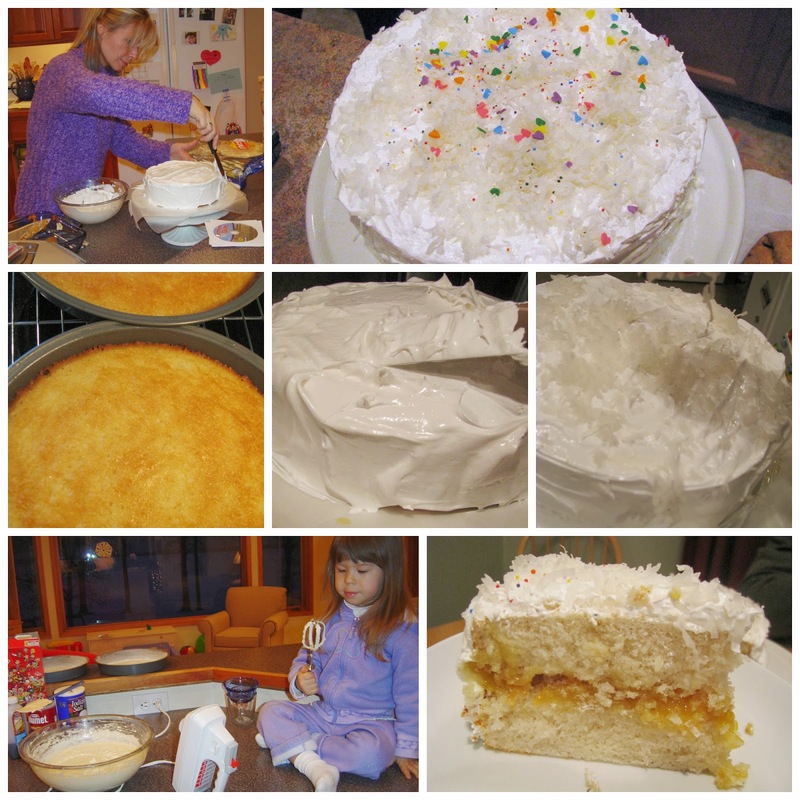 That, my friends, is Betty Crocker's Silver White Cake with White Mountain Frosting, and it is a dream. It is the yang to chocolate cake's yin, the light to the dark, the angel to the devil. And maybe because my birthday is in January, when I'm sick to death of rich Christmas treats and the snow is piled up outside my window in thick drifts, this cake is my true birthday love. As the name implies, the cake itself is pure white (shortening instead of butter and no egg yolks in the batter; that's the secret). The lemon curd filling adds the perfect tangy flavor boost, and the marshmallow-like frosting is the literal icing on the cake. I add sweetened, shredded coconut to the top (and sprinkles, as I deem necessary) because that makes me extra happy. 1. Preheat oven to 350 degress. Grease, flour and put wax or parchment paper cutouts in 2 9-inch round cake pans. 2. Combine flour, sugar, baking powder, salt, shortening, vanilla and 1/2 of the milk (1/2 cup) into a large mixer bowl. Blend about 30 seconds on low speed; scape bowl. Beat 2 more minutes on medium to high speed until well combined. Add the remaining milk (the other 1/2 cup) and the egg whites. Beat 2 more minutes on medium to high, scraping bowl as needed. 3. Pour into the prepared bans; bake 30 to 35 minutes or until toothpick inserted in center comes out clean. Let cakes cool for 10 minutes before turning out of pans, and then cool completely on wire racks. 1. If you don't know how to separate eggs, now is the time! It's not nearly as intimidating as it sounds; here's a great video that walks you through the steps. I mix the leftover yolks into a batch of scrambled eggs the next day. 2. If you need a refresher on preparing cake pans so your cake doesn't stick, I recommend this video. 3. I use Trader Joe's lemon curd, because it is amazing. But you could use whatever brand your grocery store carries; check the top or bottom shelves near the jelly. You can also make your own, but this cake is already high maintenance. Store-bought lemon cured is a worthy time saver. 1. In medium bowl, beat egg whites with electric mixer on high speed just until stiff peaks form. 2. In a 1-quart saucepan, whisk together sugar, corn syrup and water until well combined. Cover and heat to rolling boil over medium heat. Uncover and boil 4 to 8 minutes, without stirring, until a candy thermometer inserted into the mixture reaches 242°F. 3. Pour the hot sugar mixture very slowly in a thin stream into the egg whites, beating constantly on medium speed. 4. Once the sugar is all in, add vanilla. Beat on high speed about 10 minutes or until stiff peaks form. 5. 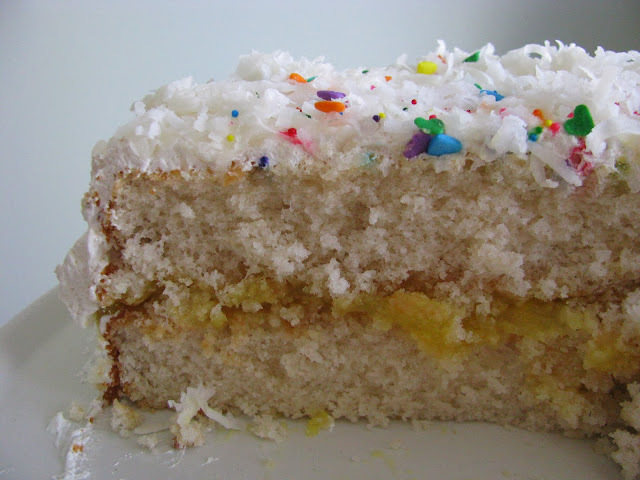 Frost cake and top with sweetened, shredded coconut. 1. Do not fear! Yes, this recipe is slightly more complicated than chocolate sour cream frosting. But it is worth your time. The key here is a candy thermometer. Insert it into the bubbling mixture when you uncover the pan and then - this is important - DO NOT LEAVE ITS SIDE. The temp accelerates so unevenly, and you need to remove that pot off the heat and start adding it to the egg whites the second it hits 242. 2. A stand mixer is almost a necessity for this recipe, because pouring the hot syrup into the egg whites WHILE BEATING THE EGG WHITES is almost physically impossible for one person. If you have a stand mixer, you just turn your mixer (whisk attachment) on low or medium low while you add the sugar syrup and then turn that puppy up to high and let it go. If you don't have a stand mixer, now is the time to find a good friend to come and help you out. I've done it by myself without a stand mixer, many times, so I'm not saying you can't try. I'm just saying it's a black belt move and molten sugar burns something fierce. 3. Put the pan you used to melt your sugar under HOT running water, and it will clean right up.